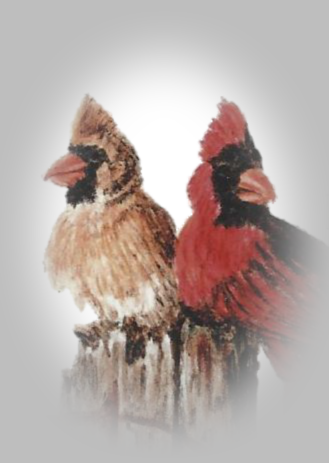 The Cardinals of Cardinal Bluff! Joy Ross Davis’ debut novel was released as an ebook earlier and is now available in print. My opinion of the book remains the same — “There are three elements that immediately attracted me to the story in Countenance and they weren’t the wonderful, strong and wise angels! First, I love huge, sensible, kid-lovin’ dogs like LuLu. Second, I can’t stay away from old historic buildings, especially those that have been converted into modern uses like a the Play House Inn Bed and Breakfast! Third, I’m a goner for individualistic, soul healthy cooking and magic, secret ingredients like that used by Sylvie Wolcott when she cooks for her guests at the Play House Inn. I could go to the Play House Inn and play house in the kitchen any time! I would let the dog have treats while we wandered from kitchen to attic, ‘petting’ the woodwork. But, there is more than kitchen and pet attraction in the atmosphere around the Play House Inn. Aunt Sylvie offers shelter to her niece, Nealey, who has endured an horrific tragedy. Nealey’s path back to living is surrounded by loving family on all spiritual planes, a huge, protective dog and those strong and wise guardian angels. The support team has its work cut out because evil has come to the Play House too. Evil that would destroy Nealey and all of the others to get to her. In an environment where tragedy has ruled for generations, why would evil not be the winner? It doesn’t look good. You will be taken directly to the Book Notes page for your free gift! Please check your spam box if you do not receive a confirmation email from me in the next few minutes. You must confirm your interest. Thank you. Come on in, Guest Blogger! Glad to see ya!